Fass, Michal N. Khoury-Kassabri, Mona and Koot, Hans M. 2018. Associations between Arab Mothers’ Self-Efficacy and Parenting Attitudes and their children’s Externalizing and Internalizing Behaviors: Gender Differences and the Mediating Role of Corporal Punishment. Child Indicators Research, Vol. 11, Issue. 4, p. 1369. Pincock, Heather 2018. Can democratic states justify restricting the rights of persons with mental illness? Presumption of competence, voting, and gun rights. Politics, Groups, and Identities, Vol. 6, Issue. 1, p. 20. Shaikh, Arshi and Kauppi, Carol 2015. Postpartum Depression: Deconstructing the Label Through a Social Constructionist Lens. Social Work in Mental Health, Vol. 13, Issue. 5, p. 459. Wolfe, Frederick Häuser, Winfried Walitt, Brian T. Katz, Robert S. Rasker, Johannes J. and Russell, Anthony S. 2014. Fibromyalgia and Physical Trauma: The Concepts We Invent. The Journal of Rheumatology, Vol. 41, Issue. 9, p. 1737. Melrose, Karen L. Brown, Gordon D. A. and Wood, Alex M. 2013. Am I Abnormal? Relative Rank and Social Norm Effects in Judgments of Anxiety and Depression Symptom Severity. Journal of Behavioral Decision Making, Vol. 26, Issue. 2, p. 174. Reed, Geoffrey M. Spaulding, William D. and Bufka, Lynn F. 2009. The relevance of the International Classification of Functioning, Disability and Health (ICF) to mental disorders and their treatment. Alter, Vol. 3, Issue. 4, p. 340. Cummins, Ian 2007. Boats against the current: vulnerable adults in police custody. The Journal of Adult Protection, Vol. 9, Issue. 1, p. 15. Collins, Mick and Wells, Helen 2006. The politics of consciousness: illness or individuation?. Psychotherapy and Politics International, Vol. 4, Issue. 2, p. 131. Hellzen, Ove and Asplund, Kenneth 2006. Nurses' narratives about their residents when caring for people with long-term mental illness in municipal group dwellings. International Journal of Mental Health Nursing, Vol. 15, Issue. 1, p. 60. Faucher, Luc Poirier, Pierre and Lachapelle, Jean 2006. La théorie des systèmes développementaux et la construction sociale des maladies mentales. Philosophiques, Vol. 33, Issue. 1, p. 147. Jablensky, Assen 2005. Boundaries of mental disorders. Current Opinion in Psychiatry, Vol. 18, Issue. 6, p. 653. Williams, Charmaine C. and Collins, April A. 2002. The Social Construction of Disability in Schizophrenia. Qualitative Health Research, Vol. 12, Issue. 3, p. 297. Goodman, Yehuda and Witztum, Eliezer 2002. Cross-cultural encounters between careproviders: rabbis’ referral letters to a psychiatric clinic in Israel. Social Science & Medicine, Vol. 55, Issue. 8, p. 1309. Witztum, Eliezer and Goodman, Yehuda 1999. Narrative Construction of Distress and Therapy: A Model Based on Work with Ultra-Orthodox Jews. Transcultural Psychiatry, Vol. 36, Issue. 4, p. 403. Klasen, Henrikje Crimlisk, Helen and Welch, Sarah 1997. Women, mental health and the family. Psychiatric Bulletin, Vol. 21, Issue. 08, p. 467. Cathébras, P 1997. Qu'est-ce qu'une maladie ?. La Revue de Médecine Interne, Vol. 18, Issue. 10, p. 809. Lee, Sing 1995. Self-starvation in context: Towards a culturally sensitive understanding of anorexia nervosa. Social Science & Medicine, Vol. 41, Issue. 1, p. 25. Hamid, Walid Abdul Howard, Robert and Silverman, Marisa 1995. Needs assessment in old age psychiatry?a need for standardization. International Journal of Geriatric Psychiatry, Vol. 10, Issue. 7, p. 533.
Cooper, Brian 1994. Sociology in the context of social psychiatry. Acta Psychiatrica Scandinavica, Vol. 90, Issue. s385, p. 39. Feudtner, Chris 1993. “Minds the Dead Have Ravished”:1 Shell Shock, History, and the Ecology of Disease-Systems. History of Science, Vol. 31, Issue. 4, p. 377. Brown, G. W., Monck, E. M., Carstairs, G. M. & Wing, J. K. (1962). Influence of family life on the course of schizophrenic illness. British Journal of Preventive and Social Medicine 16, 55–68. Brown, G. W., Birley, J. L. T. & Wing, J. K. (1972). Influence of family life on the course of schizophrenic disorders: a replication. British Journal of Psychiatry 121, 241–258. Buchwald, D., Sullivan, J. L. & Komaroff, A. L. (1987). Frequency of ‘chronic active Epstein–Barr virus infection’ in a general medical practice. Journal of the American Association 257, 2303–2307. Carrter, A. M. (1971). Scientific manpower for 1970–1985. Science 172, 132–140. Clausen, J. (1981). Stigma and mental disorder: phenomena and terminology. Psychiatry 44, 287–296. Cluff, L. E., Trever, R. W., Imboden, J. B. & Canter, A. (1959). Brucellosis. II. Medical aspects of delayed convalescence. Archives of Internal Medicine 103, 398–405. Editorial: Delusions about mental health. (1986). New York Times, 1 08. Einstein, A. (1934). On the method of theoretical physics. 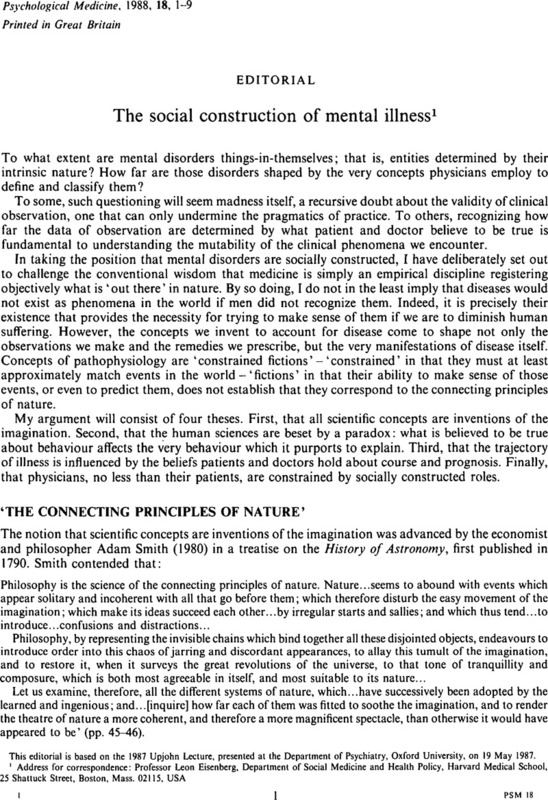 Philosophy of Science 1, 162. Eisenberg, L. & Kleinman, A. (eds.) (1981). The Relevance of Social Science for Medicine, pp. 8–11. Reidel: Boston. Falloon, I. R. H., Boyd, J. L., McGill, C. W., Lazani, J., Moss, H. B. & Gilderman, A. M. (1982). Family management in the prevention of exacerbations of schizophrenia: a controlled study. New England Journal of Medicine 306, 1437–1440. Falloon, I. R. H., Boyd, J. L. & McGill, C. W. (1985). Family management in the prevention of morbidity of schizophrenia: clinical outcome of a two-year longitudinal study. Archives of General Psychiatry 42, 887–896. Frank, P. (1947). Einstein, His Life and Times, pp. 140–142. Knopf: New York. Gruenberg, E. M. (1967). The social breakdown syndrome: some origins. American Journal of Psychiatry 123, 1481–1489. Holmes, G. P., Kaplan, J. E., Stewart, J. A., Hunt, B., Pinsky, P. & Schonberger, L. (1987). A cluster of patients with a chronic mononucleosis-like syndrome is Epstein–Barr virus the cause? Journal of the American Medical Association 25, 2297–2302. Imboden, J., Canter, A. & Cluff, L. E. (1961). Convalescence from influenza. Archives of Internal Medicine 108, 393–399. Kanter, J., Lamb, H. R. & Loeper, C. (1987). Expressed emotion in families: a critical review. Hospital and Community Psychiatry 38, 374–380. Karno, M., Jenkins, J., de la Selva, A., Santana, F., Telles, C., Lopez, S. & Mintz, J. (1987). Expressed emotion and schizophrenic outcome among Mexican-American families. Journal of Nervous and Mental Disease 175, 143–151. Leff, J. P., Kuipers, L. & Berkowitz, R. (1985). A controlled trial of intervention in the families of schizophrenic patients: a two-year follow-up. British Journal of Psychiatry 146, 594–600. McFadden, R. D. (1986). Man with a sword kills two on Staten Island ferry. New York Times, 8 07. Monahan, J. (1981). The Clinical Prediction of Violent Behavior. DHHS No. (ADM)81–921: Washington, D.C.
Sartorius, N., Jablensky, A., Korten, A., Ernberg, G., Anker, M., Cooper, J E. & Day, R. (1986). Early manifestations and first contact incidence of schizophrenia in different cultures. Psychological Medicine 16, 909–928. Sepejak, D., Menzies, R. J., Webster, C. D. & Jensen, F (1983). Clinical predictions of dangerousness. two-year follow-up of 408 pre-trial forensic cases Bulletin of the American Academy of Psychiatry and Law 11, 171–181. Smith, A. (1980) In Essays on Philosophical Subjects (ed. Wightman, W. P. D. and Bryce, J. C.), pp. 45–46; 104–105. Clarendon Press: Oxford. Steadman, H. J (1983). Predicting dangerousness among the mentally ill: art, magic and science. International Journal of Law and Psychiatry 6, 381–393. Stone, D. A. (1979). Diagnosis and the dole: the function of illness in American distributive politics. Journal of Health Politics, Policy and Law 4, 507–521. Sullivan, R. (1986 a). State panel criticizes emergency psychiatric care New York Times, 3 08. Sullivan, R. (1986 b). Psychiatric treatment surging since ferry killings. New York Times, 25 07. Sullivan, R. (1986 c). City is planning a shift of psychiatric patients. New York Times, 14 08. Sullivan, R. (1986 d). State asking hospitals to add psychiatric beds. New York Times, 14 11. Sullivan, R. (1986 e). State seeks cut in psychiatric patients. New York Times, 17 08. Turner, V. (1967). The Forest of Symbols, p. 392. Cornell University Press: Ithaca. Unschuld, P. (1986). The conceptual determination of individual and collective experiences of illness. In Concepts of Health, Illness and Disease (ed. Currer, C. and Stacey, M.), pp 51–70. Berg: New York. Waxler, N. E. (1979). Is outcome for schizophrenia better in nonindustrial societies? The case of Sri Lanka. Journal of Nervous and Mental Disease 167, 144–158. Wing, J. K & Brown, G. W. (1970). Institutionalism and Schizophrenia. Cambridge University Press: Cambridge. World Health Organization (1973). Report of the International Pilot Study of Schizophrenia. WHO: Geneva. Yellin, E, Nevitt, M. & Epstein, W (1980). Toward an epidemiology of work disability. Milbank Memorial Fund Quarterly/Health and Society 58, 386–415.